The light of the campfire draws a warm bubble in the night, separated from the frozen, still nature, slumbering in the darkness. An unforgettable evening, the roaring fire and the spectacular dance of the Northern Lights awaits you in the Aurora Camp, on the shore of a picturesque lake. The Aurora Expedition is made in comfort by bus. On the way, we stop to take photos at the rugged Lake Inari, which was believed to be the home of Ukko the Overgod by the ancient Laplanders. From there, we continue on to the Aurora Camp on the shore of the lake. In the camp, we warm up in a cozy hut by the fire, enjoy a warming drink and prepare a traditional Lapland midnight snack while waiting for the Northern Lights to appear on the horizon. 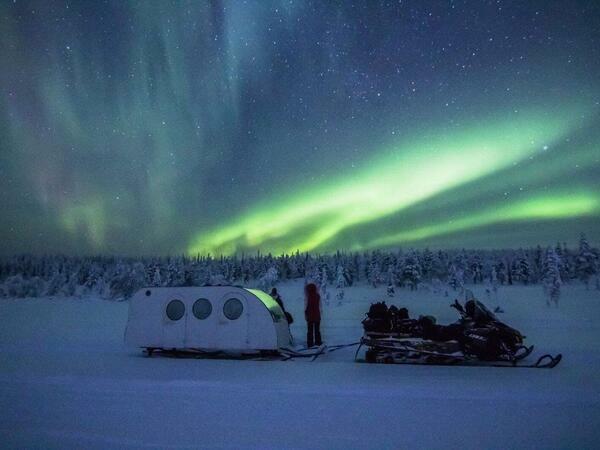 Take a seat on the bus and enjoy the nocturnal landscape of Lapland. We drive through the silent village of Ivalo and the tiny Nellim, on the winding road toward the slumbering border of our enormous neighbor Russia. From the border, we continue on for a kilometer to the Paatsjoki River bridge. We will make a fire under the open sky and wait for the Northern Lights to flare up. And when they do, the sight is incomparable: the river flowing freely and rapidly towards Russia, reflecting the red and green flames of the Northern Lights covering the skies, and the snow-covered trees. An experience you will remember for the rest of your life. Two people can fit on one snowmobile, so share & save! Drive your own snowmobile, guaranteed! Travelling alone? You don't necessarily have to pay for an individual snowmobile. Share the snowmobile with another guest! Take a snowmobile through the nocturnal snow-covered forest, far away from the residential areas and their light pollution, up the slopes of the silent snowy fells. Up in the fell, we warm up by the fire under the starry sky and wait with an evening meal and hot drinks. Are you the one who sees the first flare of the Northern Lights? Compose your photos to include the Northern Lights, the snow-covered conifers, and the fells or just let the unforgettable sights enchant you. Our snowmobiles are new, extremely easy to use, and safe. If you wish, you can also hop into the sleigh towed by the guide and focus on enjoying the experience with all of your senses. The silent, snow-covered forest, the nocturnal fell on the edge of the boundless wilderness, and the magical Northern Lights above you. Take a seat in the heated Aurora sleigh and enjoy! Your guide tows the sleigh with a snowmobile through the snowy, moon and starlit landscape, all the way to the top of the fell, far away from the residential areas and their light pollution. After arriving, we prepare our cameras and take photographs of the northern night sky. We wait for the Northern Lights to appear in comfort by the fire, enjoying hot drinks and listening to tales until someone spots the first flare. Now your imagination is the only limit: The Northern Lights waving across the sky, the constellations, snowy trees, and the glittering snow-covered fells… How will you compose your photos? In the quiet forest, the only sound comes from the crunching snow as you walk over the snowdrifts that can get up to one-meter-thick in your snowshoes past the trees bent under the snow. The slumbering forest is lit only by the moon and the millions of stars. You feel connected to the ancient nature. In the fell, a cozy hut is waiting for you to build a fire and enjoy some snacks and warm drinks while you wait for the Northern Lights to flare up. 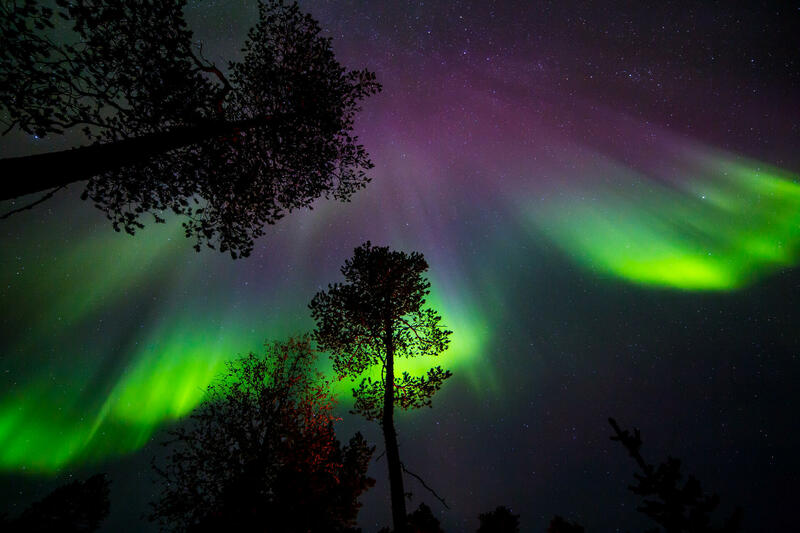 With any luck, you get to be witness to a magnificent show as the waving Northern Lights expand across the universe. 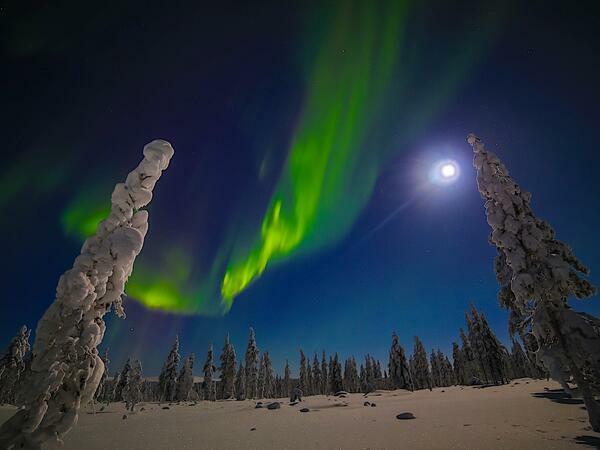 Make the most out of the opportunity to photograph the Northern Lights. During the photography workshop you will learn all the tricks you need to capture the Northern Lights and the night sky in such a way that your photos are an accurate representation of reality. 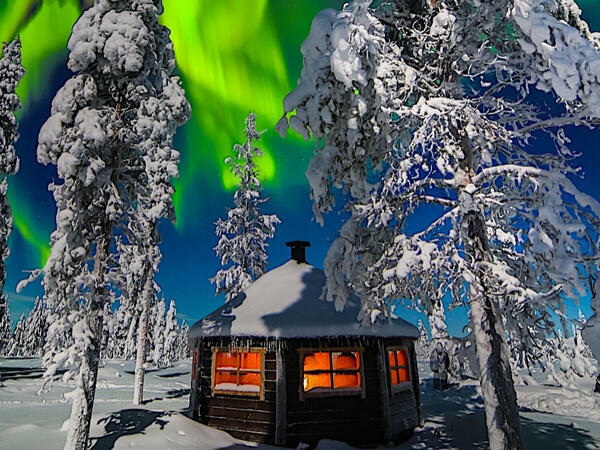 Your instructor has twenty years’ worth of knowledge and experience of photographing the Northern Lights. The workshop provides you with just the right tips on how to handle your camera and set the exposure and shutter to be able to share the magic of the Northern Lights with your friends with the best possible photos. Take a comfortable seat in the Northern Lights Village’s limousine and enjoy the nocturnal, wintry landscape. We drive through silent, unlit roads of rural Lapland far away from villages and light pollution to see the Northern Lights. 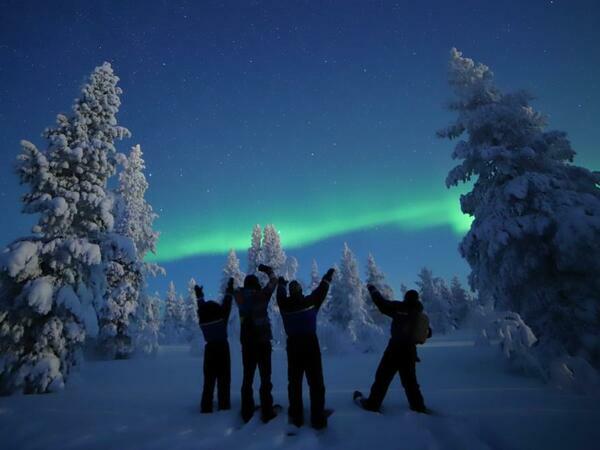 Your guide will take you to locations where the conditions are most optimal for the northern lights to appear. When an aurora burst is spotted, the guide will stop the car and you can hop out to marvel at the spectacle. Or just pop your head out the limousine roof window if you don’t like the cold. After that we will drive up to a quiet spot to make a fire and enjoy warm drinks and an evening snack. 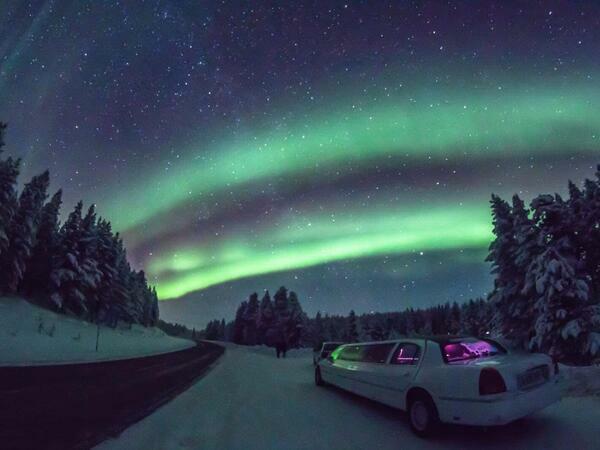 The Limousine Aurora hunt is private activity for 1 – 8 persons (the limousine seats up to 6 people in the back and 1 in the front seat next to the driver). 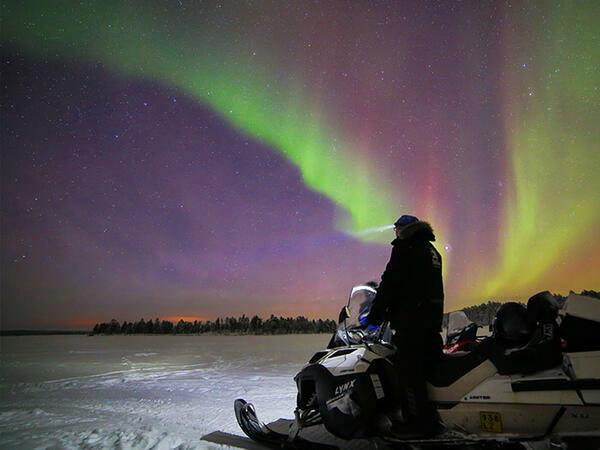 Photography oriented: Our guides are professional aurora photographers and are equipped with professional camera gear and they can capture the special moments for you. We also rent SLR Cameras and tripods. If you wish to take you own photos the guide will share his/her tips and tricks to help you capture the perfect frame.